Design your own flags permanently printed and available in custom sizes. Create your flag using your own photos, graphics, and text. It could be your country flag with text, or perhaps a corporate flag with the company logo emblazoned across it. Made with stiff and strong Voille de Ville poly fabric, your personalised flag will not fray and your print won't wash off or fade over time. Custom sized flags are available with or without eyelets and a pole pocket for easy mounting. Lovingly handmade in-house by our talented artisans. You can create your own customised flag for any occasion or event with our flag design system. Perfect for celebrating international sporting events, you can choose your country from our full range of country flags in the gallery. Your customised flags are handmade by us and designed by you. Add text, photos, or modify with names and logos. Custom printed flags are a great way to support a cause or decorate your upcoming corporate or branding event. You can personalise your flag in any way you like and it will be printed and sewn to order. Choose from a wide range of flag shapes and sizes or create your own custom sized flags with your own dimensions. Care: 100% polyester. Strong with long life. Wash at 30°c. Guaranteed: 2 year guarantee on print, material and stitching finish. Your custom flags made using modern printing technology, which ensures your designs are permanently bonded to the fibres of the material. 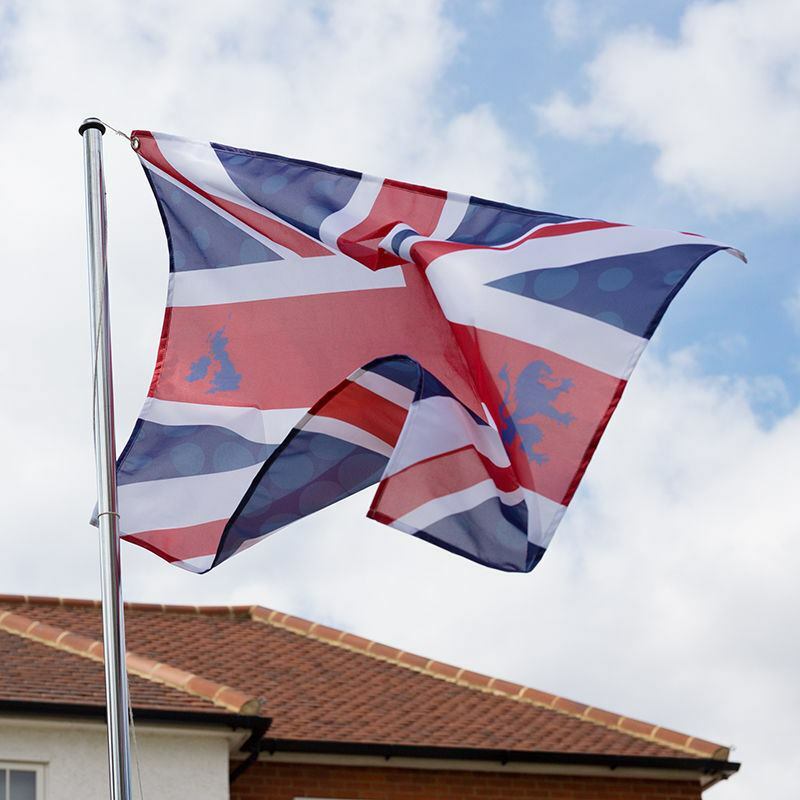 Your flag designs are printed onto Voille de Ville poly fabric which is a semi-translucent, splash-proof, woven material. Your designs are printed one side with excellent show through, and will not rub off or fade from multiple uses. Your fabric is then cut to size and carefully stitched. Your choice of eyelets or flag pole pocket is then added or, if you chose none, your flag is sent straight off to be expertly quality checked, before being sent out to you. Note: When designing a custom printed flag, shrinkage of 10-15mm on average, or 2%, can occur during the production process. If size is critical, please allow for this processing variation. Choose from our standard flag sizes or select our custom made option to have your personalised flag in any size you need. Our service is popular for football flags, rugby flags, and Olympic flags customised for individual supporters. Take your pick from our large selection of flag sizes or pre-set country flags, and use them as a base to add messages, names, graphics or text. You can modify or add anything even after previewing your order. Company and corporate flags can also be made to order. You can upload your logo, company name, and even your motto and values. Design your own custom company flags for indoor or outdoor corporate use, and they'll be send to you in a matter of days, ready to hang up with pride. Our custom flags can be printed with any logo representing your team, school emblems, or you could choose to just add text and in full matching colours. Choose to add a pocket sewn down the edge for slipping over your existing flag poles, or add two eyelets to mount your flag. To order custom flags online, press start design above, select your custom size flag, then upload your images and text. Please note: If choosing the pocket finish option, the top of the pole pocket is not stitched. Personalised satin banner with your text and pictures that you design online. Folding stools with canvas seat that we personalise for you. Design one online now. Footstools and seats. Custom Printed bunting personalised for your event or celebration. Photo bunting flags.